Well a few more 9-patches were done last night. I'm about at the end of my teeny tiny bits of scraps - I've had to start cutting small pieces out of my bigger chunks! I still have about 10 more 9-patches to go. 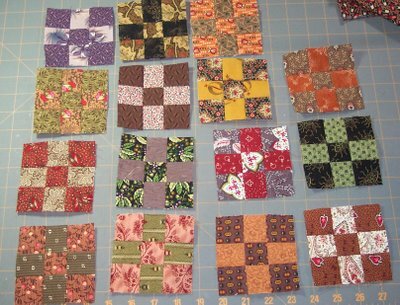 It sure does take a long time to cut for these scrappy 9-patches (well that and finding the fabric!). And I finally completely finished my own thread organizer! I showed you a picture of 2 I made last spring for gifts, but I just never got around to making one for ME! I made the large and small version for me! Isn't the fabric great! And I spent last night while watching "Lost" filling it up with my applique thread! Now isn't that pretty! I even have space for a few more spools! Guess I"ll need to go shopping for a few more colors! 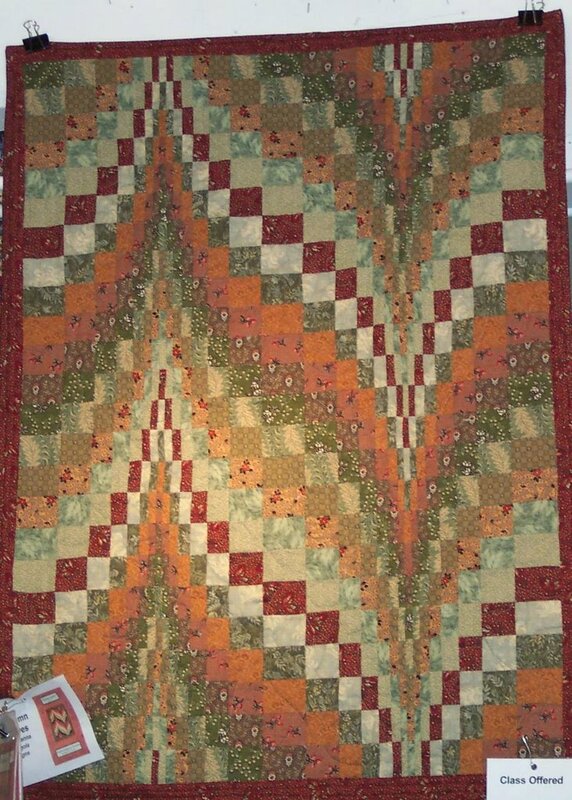 And last but not least is an old small bargello wall hanging I made years and years ago. I even realized that I really didn't have a good picture of it while searching for one last night! All I've come up with is a picture of it hanging from the ceiling at a quilt store. 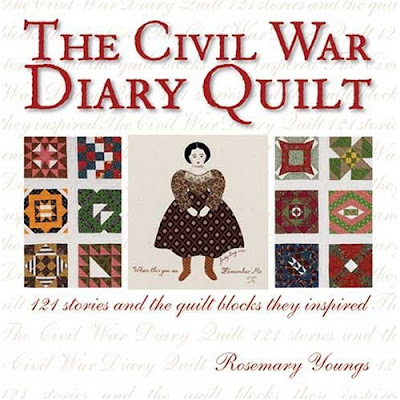 But I thought of this quilt because while digging through my reproduction scraps I found a few strips left from this quilt - which made me think of it! 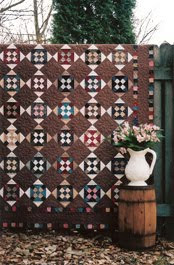 It was done with my favorite darker colors and reproduction fabrics. Doesn't it look great! Now I need to take it out and hang it up somewhere for the fall! What a great idea for using up your stash!!! They are so cute and tiny. That is a pretty nice looking stash of threads you have going there -- so many colors to choose from. Your bargello will make a perfect fall decoration. It has wonderful colors. Love all the yummy colors in your thread organizer! never had the patience for bargellos but yours is a beauty!! 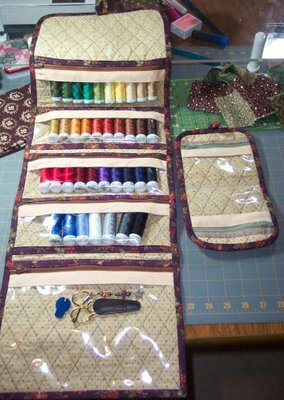 Also greatly admire your thread organizer- I made one similar, some years ago, but it is nowhere near as nice as yours. I can't wait to see what you do with those 9-patch blocks, I love the colors. The thread organizers are really nice, I'm going to be on the lookout for a pattern for those. Hope you're getting better weather than we are, we got snow today! Wow Dawn, those 9-patches! How teeny tiny! 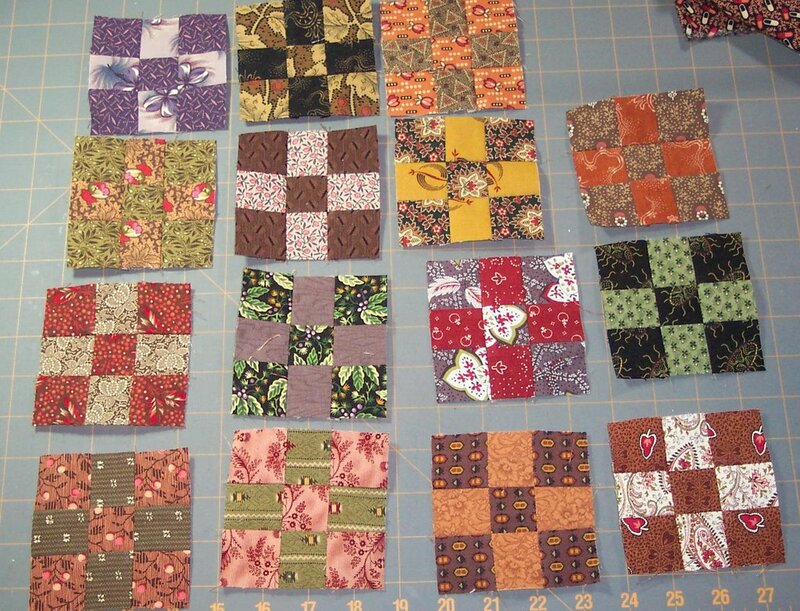 They look great, and yes, doing them scrappy sure takes a lot more time than strip piecing, huh? I love your thread organizer- so professional looking! And the Bargello! Love that! You're a very busy camper! Wow Dawn I've never seen a Bargello before. I'll have to look out for a pattern - that really appeals to me. WHat a good job you did! Your thread organiser is amazing - I would LOVE one! All your quilts are beautiful. I decided not to write comments - this one is beautiful, this one is beautiful, etc. The bargello looks like it is three dimensional - like the fabric is really folded - neat illusion! Definitely hang it up. 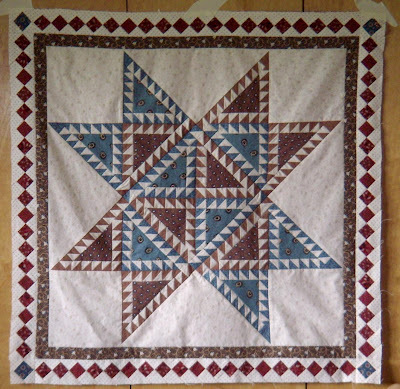 I like the red and cheddar stars too. The blue one is lovely - you should definitely finish it. I'm sure you will add to the beauty when you do. I like all the different designs in the house one. I just might have to buy this pattern after all. You mentioned knowing how to shorten zippers one day and I could never find out how. Do you mind sharing one day? I'de love to know how to do this. what is the pattern for the thread organizers?